Five Wabash students received Fulbright English Teaching Assistant awards for 2018-19: Joey Dierdorf ’18 to Germany, Marcus Hoekstra ’18 to Spain, Michael Lumpkin ’18 to Mexico, Immanuel Mitchell-Sodipe ’18 to Paraguay, and Aren Peterson ’16 to Germany. That number places Wabash among the 40 top Fulbright-producing baccalaureate institutions nationally. The Fulbright U.S. Student Program is the largest U.S. exchange program, offering opportunities for students and young professionals to undertake international graduate study, advanced research, university teaching, and primary and secondary school teaching worldwide. The program awards approximately 1,900 grants annually and operates in more than 140 countries worldwide. Wabash enjoyed a high success rate relating to this group of Fulbright recipients. In the fall of 2017, 14 students completed applications for a Fulbright award to complete research or serve as an English Teaching Assistant abroad. Of those 14, half were named semifinalists. Of those, six were declared Fulbright recipients (one declined to accept another award) and a seventh was named an alternate. 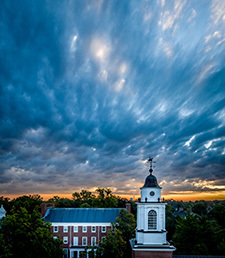 Over the last six years, 38 Wabash men have earned international fellowships. The list includes a Rhodes Scholar, 17 Fulbright recipients, 13 Gilman Scholarship recipients, five USTA fellowship recipients, a TAPIF English Teaching Assistant (France), and a North American Language and Culture Assistantship in Spain.